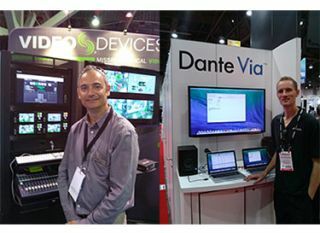 Paul Isaacs, transitioning from engineering to marketing, is doing a bang-up job explaining the features of the Video Devices 270 at InfoComm 2014. Video Devices is the new brand identity launched by Sound Devices to differentiate between its products. The 270 is a powerful beast in a small box: 64 MADI and 64 Dante audio inputs; simultaneous or sequential video (ProRes, DNxHD) and audio recording to four drives; one or multiple units can be controlled via web browser, with frame-accurate sync. Oh, and you won't lose your recording in the event of an external power failure. Paul Isaacs, transitioning from engineering to marketing, is doing a bang-up job explaining the features of the Video Devices 270 at InfoComm 2014. UK live sound mixing console company Cadac is ramping up sales and support efforts in the US with the appointment of industry vet Paul Morini as general manager of its new Cadac USA operation. Paul has his sales pitch down to a single line: "Go ahead and mix." The console is that intuitive. Audinate just made building an audio network much simpler with its new Dante Via, being demonstrated here by principal engineer James Westendorp. Audinate just made building an audio network much simpler with its new Dante Via, being demonstrated here by principal engineer James Westendorp. All a user needs is two or more computers; no extra hardware required. Simply plug mics, I/O interfaces and other devices into the computers and voila! You have an audio network unconstrained by the relatively short reach of analog and USB cables. Highlight of InfoComm 2014 so far has to be the 13-foot-tall Kuratas diesel-powered killer robot from Suidobashi Heavy Industry. Well, it's not exactly on the show floor, but Dan at SSL was good enough to bring it to a reporter's attention. For just $1.3 million you can pilot a robot...armed with twin Gatling guns.